US-based biotechnology firm Juventas Therapeutics has started enroling patients in its Phase II trial (STOP-PAD) of JVS-100 to treat advanced peripheral artery disease (PAD). JVS-100 is a gene therapy that encodes human stromal cell-derived factor-1 (SDF-1). Around 120 patients will be enroled in the double-blind trial at about 25 leading clinical centres in the US. The trial is designed to evaluate JVS-100 in patients with advanced PAD, who have undergone a below-the-knee (BTK) revascularisation procedure, and sustained non-healing wounds symptomatic of the disease. The first patient in the trial was enroled at Holy Name Medical Center in Teaneck, New Jersey. Within 48h of the BTK revascularisation procedure, randomised subjects will be administered with JVS-100 or placebo via intramuscular injection to the affected limb. They will receive the same treatment three months later to evaluate JVS-100’s ability to improve outcomes. The trial’s primary endpoint will assess how wounds have healed months after the procedure. Holy Name Medical Center Interventional Institute medical director Dr John Rundback said: "We are excited to be part of the STOP-PAD study and to have enrolled the first patient in this ground-breaking trial. "The use of an advanced biologic as an adjunctive therapy to improve outcomes associated with below the knee revascularisation is an exciting and innovative step forward for the field, and may establish a new standard of care for treating diabetic and other patients with difficult and leg-threatening vascular wounds, who otherwise face the possibility of amputation." "In previous clinical studies, JVS-100 has demonstrated the ability to improve micro-vascular blood flow and accelerate dermal wound closure." PAD is characterised by the narrowing or obstruction of arteries in limbs, which diminishes or prevents blood flow. This can result in severe pain, walking limitations, non-healing wounds and, in severe cases, the need to amputate the affected limb. The US Food and Drug Administration (FDA) has also granted fast-track designation to JVS-100 for accelerating the healing of chronic ulcers in patients with advanced PAD. 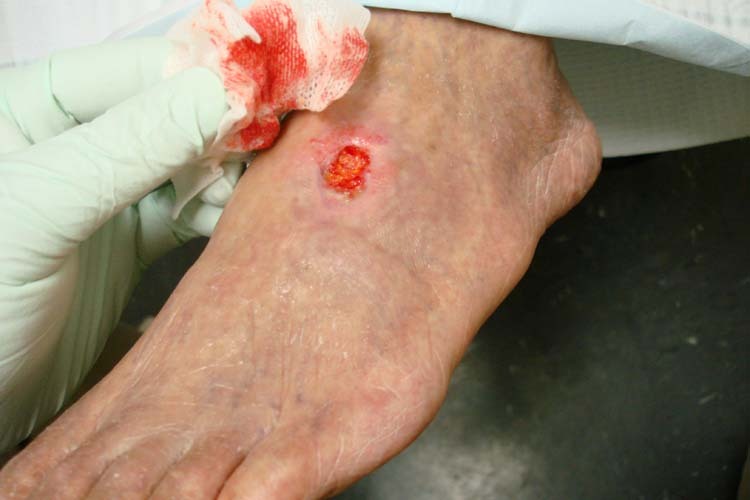 Cleveland Clinic Endovascular Services director and principal investigator for the STOP-PAD trial Mehdi Shishehbor said: "A large percentage of these individuals continue to suffer with non-healing wounds on their feet that interfere with their mobility and day-to-day living. "In previous clinical studies, JVS-100 has demonstrated the ability to improve micro-vascular blood flow and accelerate dermal wound closure. "We are excited to further study the potential for JVS-100 to address this unmet medical need in patients with advanced peripheral artery disease in addition to revascularisation." Image: An arterial insufficiency ulcer in a person with severe PAD. Photo: courtesy of Jonathan Moore.